Top: Rosé is a style of wine, not a particular grape varietal or wine region. This photo shows a Sancerre, a wine made in the eastern Loire Valley of France in the area around Sancerre, an ancient hilltop town. 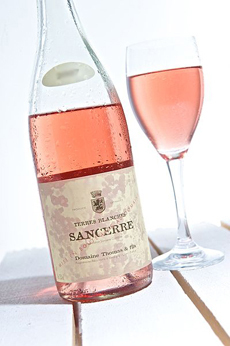 While white Sancerre is made from the [white] Sauvignon Blanc grape, red Sancerre and rosé Sancerre are both made from the [red] pinot noir grape (photo Thor | Wikimedia). Bottom: Some of the different hues of rosé wines (photo JoTot.com). In France, more rosé wine is sold than white wine [source]. Rosé is also a popular warm-weather wine, and a great pairing with grilled foods and picnic foods. So with Memorial Day at hand, how about a rosé tasting party? There are as many different styles of rosé wines as with other varietals. A tasting is an opportunity to get to know the different producers and identify some favorites. Here’s how to have a wine tasting party, although you can simply set out the bottles and let people do their own thing. The term rosé does not refer to the type of grape or the vinification process, but to the pink color. A rosé wine can be actually be made by blending red and white wine together; however this is not a common process. Most rosés are dry wines made from red wine grapes. The pink color comes from limited skin contact with the red grape skins during vinification. Rosé’s color is actually a hue of what would become red wine with longer skin contact. The juice pressed from red wine grapes is the same color as the juice from white wine grapes: clear. Red wine color comes from extended skin contact during the early stages of winemaking, a process known as maceration†. Pink wines, a term that encompasses rosé, blush, and anything else with a pink hue, can be any shade from pale pink to deep rose. It depends on the grape used and the length of skin contact (from one to three days). Blush wine is an American term that refers specifically to pink wines made from red wine grapes, with only enough skin contact to produce a “blush” of red color. The term first appeared in the U.S. in the early 1980s, as a marketing device to sell pink wines. At the time, Americans were not buying rosé wines, while White Zinfandel, with its pink hue, was flying off the shelves (at one point it was the largest-selling wine in America). There weren’t enough Zinfandel grapes to meet demand, so winemakers had to use other red grape varietals. Pink wines made from other grapes could not legally be called “White Zinfandel,” so a new category name—blush—was created. American pink wines, whether from Zinfandel or another grape, are typically sweeter and paler than French-style rosés. The term “blush” began to refer to not just to pink wines, but to those that were made on the slightly sweet side, like White Zinfandel. These days, all three terms are used more or less interchangeably by people outside the wine-producing industry. *“Red grape” skins can be black, purple or red, depending on the varietal. A rosé can also be made by blending red and white wines, although this is less common. †The skin contact phase of winemaking is known as maceration. In this phase, the phenolic materials of the grape—tannins, coloring agents (anthocyanins) and flavor compounds—leach into the must (the newly-pressed juice) from the grape skins, seeds and stems. Maceration is a food and wine term that means to soften by soaking. Here’a more about maceration.